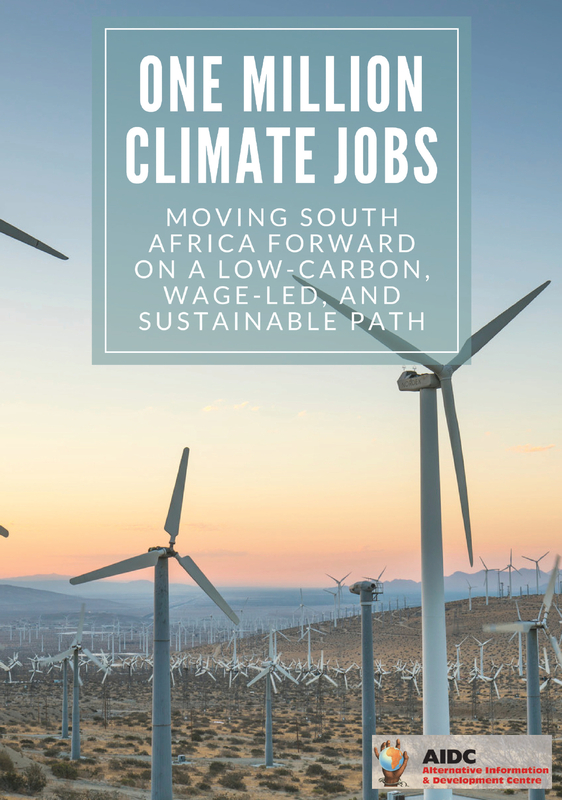 Million Climate Jobs Monthly Meetings have been taking place at AIDC´s premises since 2012. Approximately 25 participants attended the meeting on 5th May 2017. This time we welcomed Muna Lakhani as our main speaker. 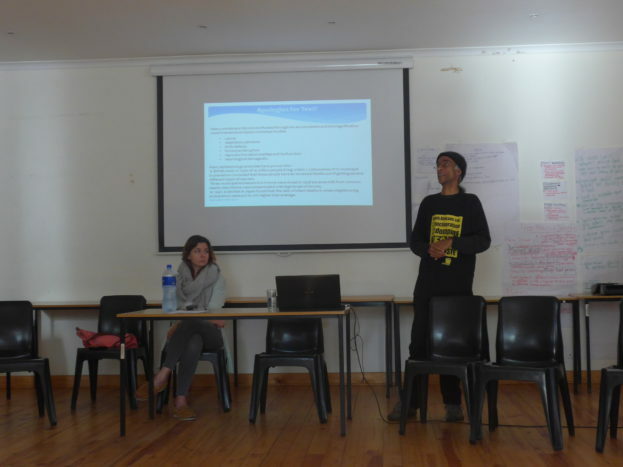 He is the Branch Coordinator of Earthlife Africa in Cape Town and the National Coordinator of the Institute for Zero Waste Africa. His input was titled “Waste to energy? Wasted energy!“. The process of converting waste to energy is called by different names, e.g. pyrolysis, thermal treatment, incineration, waste recovery through energy recovery. Behind all this is the burning of solid waste in an incinerator in order to produce power. Just recently a waste to energy conversion plant has been opened in Athlone, this is just one of many waste to energy convertion plants. There are a number of reasons why converting waste to energy in this way is not effective or efficient. One unit of electricity generated in an incinerator is even more costly than one unit produced in a nuclear power plant. Burning waste produces even more of the climate-damaging Carbondioxide than burning coal. Besides that, the incineration of plastic produces Dioxine. Although waste plant operators make you believe that Dioxine emissions can be avoided by very high temperatures, this is not the case. Moreover the ash, that makes up a quarter of the waste´s weight, is very toxic. It has to be stored under special conditions and there is always the danger of leaks. The Dioxine builds up in the food chain and in our bodies. Dioxine is very toxic and causes health problems such as cancer, lung problems, heart diseases, brain damage birth defects hormone disruption and reproductive abnormalities. Waste is not worth nothing. Many components, e.g. plastics, paper and metal, could be recycled. If you burn them instead, you create more need for new plantations to produce new paper, for more fossil fuel extraction to produce new plastics and for more mining for metals. The incinerators rely on more and more waste coming in as fuel. Every attempt to reduce waste endangers their business model. From a job creation point of view incineration does not make sense at all. Burning waste as well as dumping it in a landfill needs far less workers than recycling. Incineration treats the problem of waste from the end not from the beginning. Instead of burning waste, we should reduce it. There are various ways, e.g. recyling, reusing, or repairing. In contrast to solid waste incineration organic waste can be converted into energy in a sustainable way. Sewage, food waste and garden waste can be fed into a biogas digester. In the absence of oxygen, the material breaks down. The methane produced in this process can be collected and used for heating and cooking. The solid leftovers can be used as fertilizer. This sustainable process wastes nothing and has little to zero negative impact on the environment. Biogas digesters can be built in almost any size, from a small single-household model to a plant that uses the organic waste of a whole neighbourhood. Building a biogas digester is not rocket science and has the potential to create jobs within the community. Muna gave us an example of best practice in the Eastern Cape. The plant uses the sewage of a school´s water flushed toilets. The solid part is degraded in the biogas digester. The water, which is still rich in nutrients, is used to grow algae, that are finally fed into the biogas digester as well. The produced gas is used for cooking meals for the school children. The solid remains manure a vegetable garden, thatproduces vegetables for the school feeding scheme. The school profits from the biogas digester on multiple levels.It does not only improve the nutrition, but also the learning conditions. The students benefit from the safe dignified toilets. Female learners attendance has improved, because the girls now have a hygienic place during their period. The plant basically pays for itself. Once it is payed off it is even going to generate profit. Comrade Sizwe says, that NGO-presentations do not change the living condition of the vast maiority of waste pickers on the ground. What they need most is not access to waste, but access to land and equipment to work. REIPPs do have the potential to provide jobs, but at the moment this often does not happen in a gender-equitable, sustainableand transparent way. More engagement between the NGOs, the unions and the REIPPs is needed in order to improve this. Women from Makhaza in Khayelitsha reported, that there is a small biogas digester in their area and inquire, whether it could possibly be used for waste water treatment. According to Muna, it is probably not big enough, though wastewater in general is a good base for biogas digestion. Progressive Youth Movement committed to approach SAPSU teachers to inquire, whether a plant similar to the one that Muna presented as good example can be built at their schools. Five coal fired powerplants, namely Kriel, Komati, Hendrina, Camden and Grootvlei, are supposed to be closed down soon in order to accomodate renewable IPPs. NUM and COSATU have started a campaign to protect worker´s jobs there. The campaign targets the Government, ESKOM and the IPPs and calls the Government to stop proceeding with the IPPs. The powerstations are due to be closed down anyway because they have already exceeded their life span. ESKOM now just gives a different reason. That might well be a political move, as ESKOM apparently is against renewable energy. The parastatal refuses to sign the remaining IPP contracts since July 2016. On short term stopping renewable energy IPPs could save some coal jobs, but in the long run the IPPs provide cheaper energy and more jobs. The NUM/COSATU campaign should shift its focus to demand a proper plan by the government for a just transition rather than against IPPs. In order to avoid misconception by the trade unions it is important to provide them with good objectives and unbiased information. AIDC is concerned about the unions´ negative response to renewable energies and has started to bring together IPPs and unionists. In this context the rival unions NUM and NUMSA agreed on the importance of renewable energy. It was agreed on these meetings to continue. NUM is seeking for a meeting with their policy makers in order to change the union´s formal position on renewables. 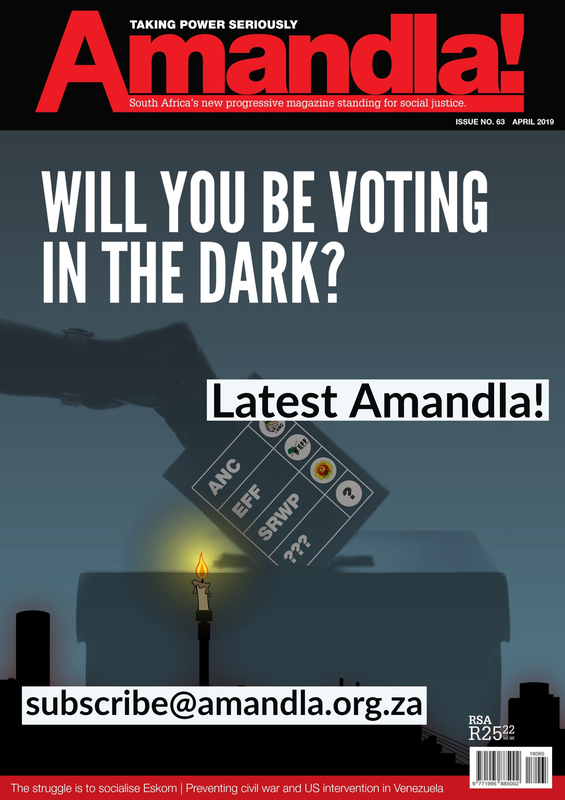 Besides that a pamphlet adressing the factual backgrounds is planned to be produced, so that unionists are no longer misled by ESKOM´s twisted information. Another outcome regards the Integrated Ressource Plan (IRP) policy review.After the consultation period the Government now seems to delay the update, probably in order to keep the space open for nuclear. A letter to the Minister of Energy was sent out, asking the question when the update is going to take place. So far there has not been an answer, but the EFF has comitted to take the letter and turn it into a parliamentary question. That means that the Government is obliged to answer within 3 weeks. The City of Cape Town has reviewed its Free Basic Water Policy. So far every household qualified for a monthly allocation of 10500l Free Basic Water. Now only “indigent“ households with a maximum monthly income of R2800 are supplied with FBW. Arising from the last Meeting EMG has written a letter asking for the reasons for the policy review. After the community had the chance to comment on the letter, it was sent to the Department of Water and Sanitation. So far there has not been a response. The upcoming water indaba (16th May) gives the opportunity to voice our concerns. Besides that a day of action as well as asking the EFF to make the letter a parliamentary statement was up for discussion. The next meeting is going to take place on Tuesday 23rd May 2017 with Tasneem Essop speaking on the just transition.